Eurocom Corporation (www.eurocom.com), a leading developer of long lifespan, fully upgradable notebooks, high performance mobile workstations and mobile servers is adding the new NVIDIA® Quadro® 5010M mobile professional graphics processing unit (GPU) as another available GPU option for the EUROCOM Panther 3.0 mobile workstation. The addition of the NVIDIA Quadro 5010M, the flagship mobile professional GPU based on the NVIDIA Fermi architecture, offers Eurocom customers an ultra high performance GPU for accelerating professional applications. The NVIDIA Quadro 5010M features 4GB of GDDR5 VRAM, providing professionals with a level of performance never before seen in a mobile platform. The EUROCOM Panther 3.0 is designed specifically for creative and design professionals, digital content creators, and engineers who demand maximum performance in a portable workstation. Eurocom Mobile Workstations are built to offer unmatched performance, long lifespan and full upgradeability of the processor, memory, storage, operating system and VGA technology, and are designed with the most innovative technology and components available, from workstation class desktop Xeon processors and RAID support to dual GPU support. As a complete, powerful, portable computing solution, the EUROCOM Panther 3.0 provides a perfect alternative to a traditional, desktop workstation, without sacrificing performance. 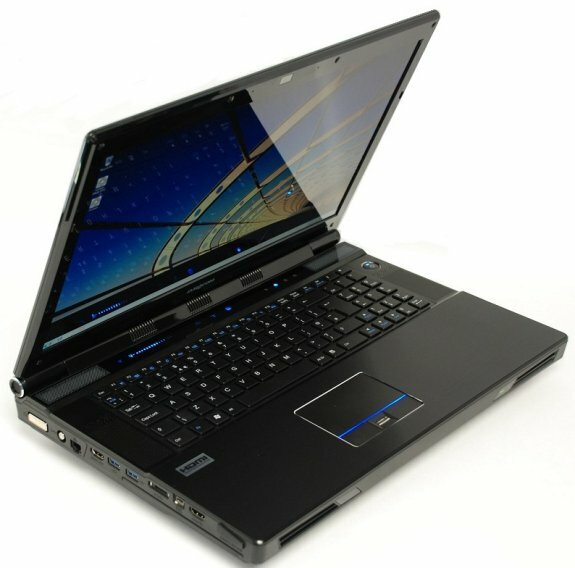 The EUROCOM Panther 3.0 provides workstation, gaming and server-calibre capabilities with 3.25 Terabytes of storage featuring four physical drives and RAID 0/1/5/10, making it the perfect mobile workstation or portable server for users who demand extra-large capacity storage and reliability. It offers powerful 3.46GHz Intel Core i7 Processor Extreme Edition I7-990X or 3.46GHz Xeon X5690 processors running at 6.4GT/sec bus speed with 12MB L3 cache, which deliver exceptional multi-tasking and multi-threaded performance. It also includes a Gigabit Ethernet port on-board, plus HDMI, eSATA, and DVI ports, with a 17.3" Full 1080p HD display, and support for a full size keyboard. Introduced earlier this year, the NVIDIA Quadro 5010M is the company’s new flagship mobile GPU. It supports Open GL 4.1, DirectX 11, Shader Model 5.0, and Error Code Correcting RAM, and is based on the NVIDIA CUDA™ architecture. The 384 CUDA cores in the Quadro 5010M can be accessed using DirectX 11 and OpenGL 4.1 for graphics rendering, and utilize Direct Compute, OpenCL, NVIDIA application acceleration engines and CUDA for general purpose calculations. Compatibility with the new stereoscopic 3D solution by NVIDIA, NVIDIA 3D Vision Pro™, is also supported. The Quadro 5010M also features an unprecedented 4 GB of fast GDDR5 memory to enable interactivity on the largest projects. Quadro mobile GPUs deliver massive performance gains when running computationally intensive applications such as ray tracing, video processing and computational fluid dynamics. Built on the innovative NVIDIA Fermi architecture, the latest Quadro mobile graphics solutions integrate high performance computing capabilities with advanced visualization, transforming mobile workstations into mobile super computers. Eurocom offers a complete line of fully upgradable Professional Level MXM 3.0b VGA modules allowing customers to upgrade to newer VGA technology, improve video performance and /or extend their notebook's lifespan. Hey Dell! Hey HP! Can you tell me why, with 100x the engineering resources of Sager, you can NEVER manage to get these cards at least at the same time a Sager? They beat you every time, year after year. And it's like you pay billions in R&D only to be the last ones out of the gate. Has to be infuriating to your investors.